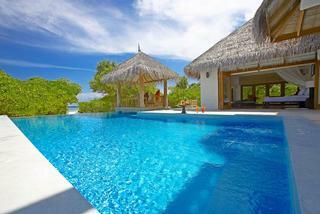 Plan your next vacation to a resort where you can jump into your own private pool. Relax in a plush lounge chair and get massages on the spacious outdoor deck. Our list includes incredible getaways in the tropics and designer shapes in Europe, the Caribbean and Mexico. Rent a pool with spectacular ocean views in Mauritius or relax next to a fantastic reflection pool surrounded by the desert. There is plenty to choose, regarding of your taste. Next Read: 15 Most Awesome Beach Picnics, Ever. This beautifully sculpted pool at Yemanja sits on a hill above the Caribbean Sea, offering beautiful views of lush green foliage and the ocean. 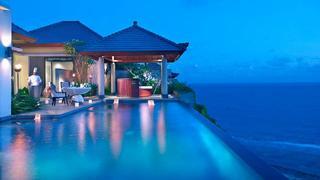 A chef will prepare a scrumptious private dinner next to this dramatic cliff-top view at the Banyan Tree Ungasan in Bali. 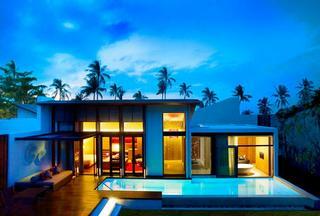 Modern design and colorful lights create an inviting ambiance at the W Retreat Koh Samui in Thailand. The Tropical Oasis has a relaxing bath next to a huge window offering great views of the ocean. 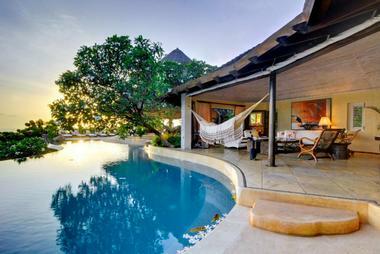 Spend youd vacation lounging surrounded by a private deck right over the ocean at Angsana Balaclava Mauritius. 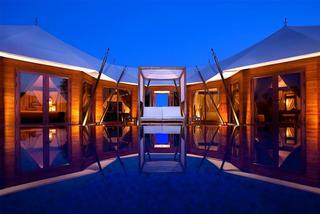 A large circular daybed is built into the pool so that you can relax surrounded by water. 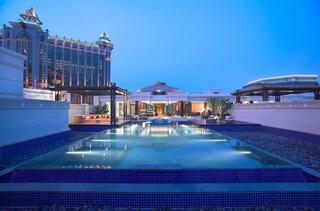 This oversized facility at a Sanctuary Villa at Banyan Tree Macau is big enough for swimming laps and playing in the water with the whole family. 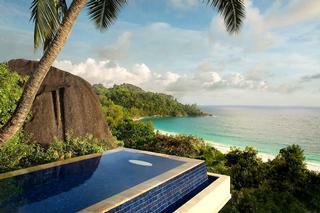 This gorgeous private pool with a palm tree over it and spectacular views of the beach and the ocean at Banyan Tree Seychelles is perfect for a special celebration or a honeymoon in the tropics. Jump into this beautiful blue water at the Island Hideaway at Dhonakuli Maldives. The private gazebo set over it is right on the sandy tropical beach. 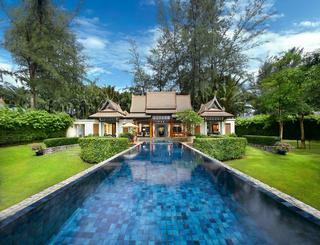 Surrounded by the lagoons of Laguna Phuket at Bang Tao Bay, these houses are spacious and luxurious. 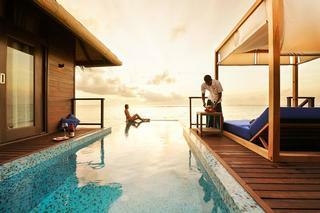 This infinity edge getaway at Coco Bodu Hithi Maldives was built around the incredible overwater view. Plush blue lounge chairs on the edgel make it easy to unwind in a spectacular setting. Each house at Laguna Resort has its own pavilion with a daybed. Relax in the shade during the day at the edge of the water. Surrounded by the romantic Arabian desert, this unique reflection pool at Banyan Tree Al Wadi is for couples and honeymooners who like unique design. 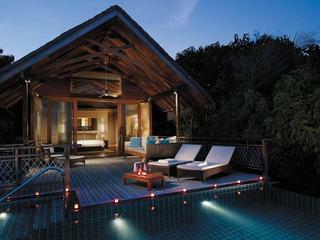 Lounge chairs with an umbrella sit at the edge of this colorful private pool at Anantara Dhigu Resort in the Maldives. 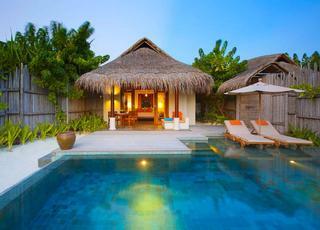 Thatched-roof houses are romantic and offer plenty of privacy. 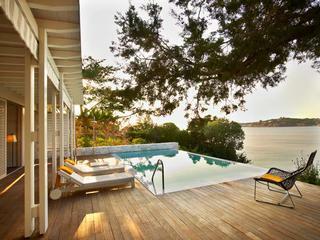 Enjoy a view of the ocean at Arion Resort in Greece and cool off during warm summer days. 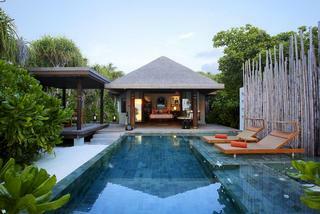 Anantara Kihavah Villas touches a white powdery beach in the Maldives. Enjoy your own private gazebo and lounge chairs in the water. 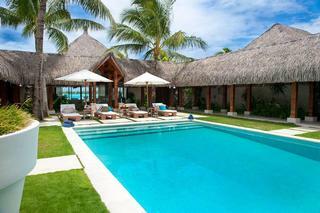 The impressive Royal Estate Pool at the St. Regis Bora Bora is located in the middle of the courtyard. Bright blue colors contrast with the bright green of the surrounding grass. 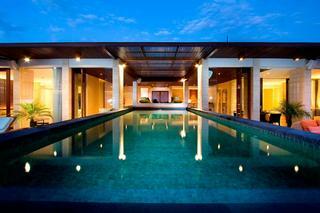 The striking designer deck is the centerpiece of the Ocean Pool Villa at Alila Villas Soori in Bali. 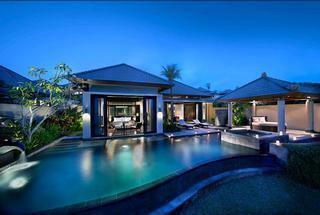 This beautiful Penthouse Pool at Anantara Seminyak is particularly impressive at night. 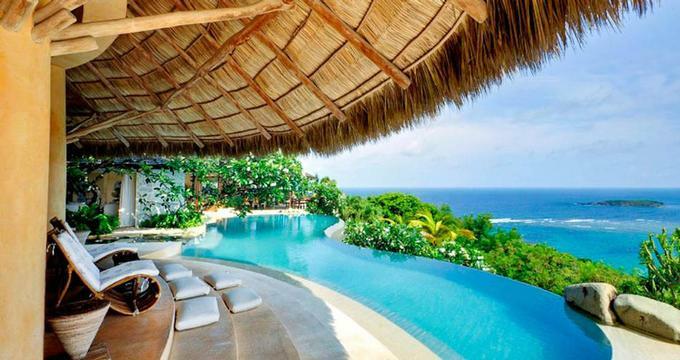 Swim laps or relax with a tropical cocktail. 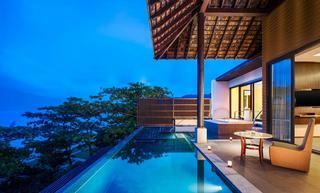 This free-form facility at Banyan Tree Ungasan has submersed steps, a jacuzzi, giant faucet and a plush daybed in the shade. 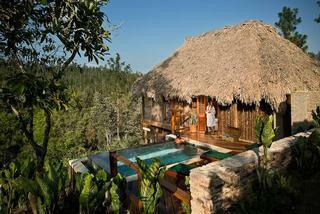 Lush tropical plants surround the private pool on stilts at Blancaneaux Lodge. 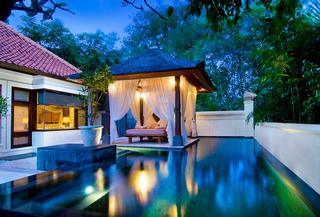 Cool off while listening to the sounds of the jungle that surrounds you. This private free-form pool at Kanuhura has a plush daybed, lounge chairs and just steps from a beautiful sandy beach in the Maldives. 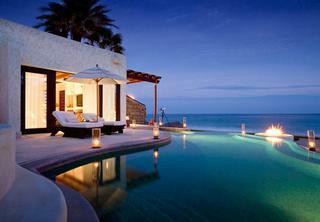 The scenic pool at Las Ventanas al Paraiso in Mexico has elegant curves and the best location right on the ocean. A telescope sits on the edge - use it to watch stars at night and passing ships during the day. 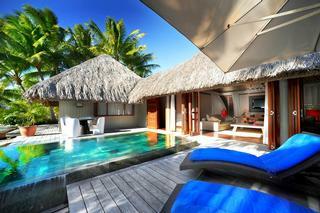 When you stay in this house at Le Meridien Bora Bora you'll be just steps from the sandy beach. But if you prefer to cool off in your own pool, that's available as well. 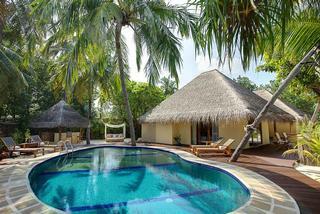 Shangri-La Villingili is a romantic resort with spectacular guest houses with private pools. Enjoy romantic candles at night. 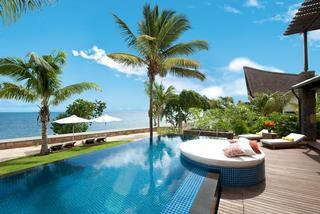 The Ocean View Villa at Vana Belle Koh Samui has a long designer pool with a view of the ocean from every spot. A cool bath tub is available as well. Click here for 16 Coolest Hotel Bath Tub Views. 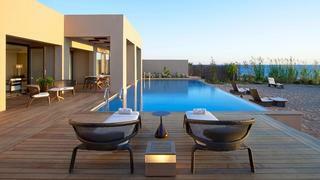 Romanos Costa Navarino in Europe has several houses with incredible private pools, including Ithomi. You'll be right next to a private sandy beach and have views of the ocean.